Shaolin vs. Ninja: What's the difference? Shaolin and ninja are some of the most mysterious and colorful characters in cinema. In fact, countless martial arts and action films have been produced wherein one or the other–and sometimes both–play essential roles. In this comparison article, we examine the key characteristics of each group. Shaolin warriors or fighters belong to a martial arts sect based in the Shaolin, China monastery. The sect has been featured numerous times in various wuxia titles, and it remains one of the largest and most recognized orthodox sects in the jianghu. Ninjas or shinobi warriors were mercenaries that served the warlords of feudal Japan. Specializing in unorthodox war related skills, ninjas were also well versed in the crafts of espionage, sabotage, and infiltration, as well as assassination. The methods and ideologies employed by ninjas placed them in stark contrast with samurai, all of who were governed by strict honor and combat codes. Virtually all Shaolin members belong to the Buddhist faith, and most are actually monks. Aside from practicing martial arts, Shaolin monks also tended to follow Buddhist practices and Buddhist codes of conduct. Such warriors typically practiced martial arts with the goal of improving health, preserving justice, helping the oppressed and for self-defense purposes. Most Shaolin disciples were therefore considered to possess a strong sense of morality and excellent mastery of the martial arts. Although reports tend to vary, most historians believe that the origin of ninjas dates back to the 14th century. Some believe however that ninjas may have existed much earlier, during the Heian and early Kamakura periods of Japan's history. In any case, the world shinobi did not come into widespread use until the 15th century, and the spies and mercenaries that existed before this period were likely not operating as a specialized force. 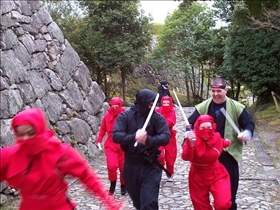 Ninjas were typically warriors who operated in stealth, and they where mostly tasked with espionage and sabotage operations, as well as assassinations. In addition to playing central roles in wuxia novels, Shaolin warriors were also featured heavily in popular culture. Countless Chinese martial arts films have been produced that feature Shaolin warriors prominently, most notably Shaolin Temple. 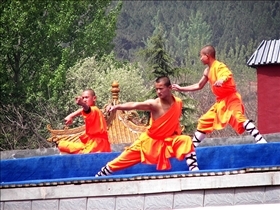 Shaolin is also considered by many to be the "origin" of all martial arts in China. Most people who are aware of Shaolin today are most familiar with the Shaolin style of Kung Fu. Ninjas have long been polar features in works of literary fiction and cinema, mostly due to their mysterious nature and extraordinary skill and ability. The highly specialized equipment that they are often depicted as using to delay effect has also been popular fodder for a host of action packed ninja themed movies. Fantasy vs. Science Fiction: What's your genre?